Much was made of Ryan Moore’s modern day record of nine winners from 28 rides at Royal Ascot. 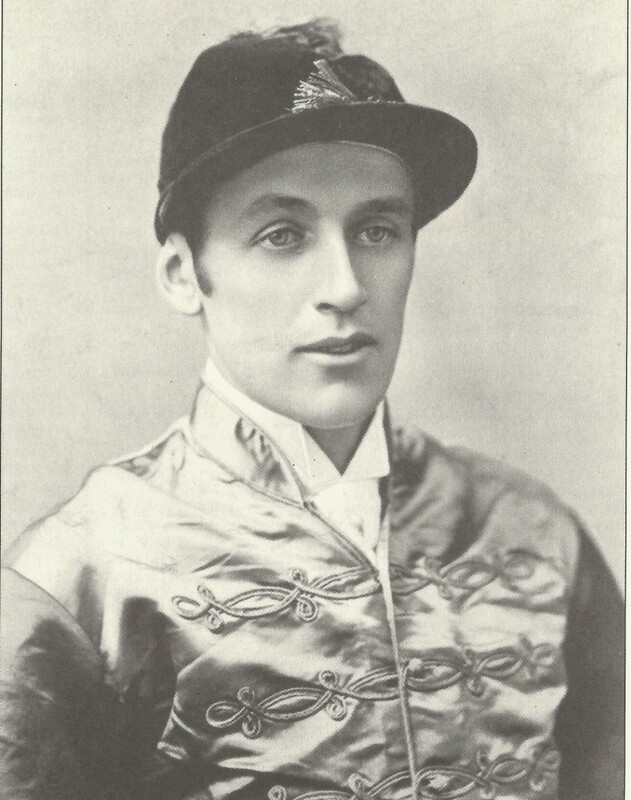 However, since Fred Archer holds the record with 12 wins from 24 rides it is worth unearthing his brilliant achievement in 1878. Ascot was then a four-day meeting. On the Tuesday, he rode one winner from seven rides – Garswood 4-9 fav in a Post Sweepstake. On Wednesday, he rode five winners from six mounts: Lady Lumley 5-4 fav in the Fern Hill Stakes; Julius Caesar 10-1, top weight (5y-8st-6lb) in the Royal Hunt Cup; Redwing 8-1 in the Coronation Stakes; Muley Edris 9-4 in the Triennial Stakes and Sonsie Queen 9-2 in the Ascot Biennial Stakes. On the Thursday, he rode three winners from six mounts: Lord Clive 1-3 fav in the New Biennial Stakes; Trappist 2-5 fav in the All-aged Stakes and Petrarch 5-4 fav in the Rous Memorial Stakes. On Friday, the final day, he rode another three winners from five mounts: Out of Bounds 5-6 fav in the Maiden Plate; Trappist 7-1, top weight (6y-9st-10lb) in the Wokingham Stakes and Jannette 4-7 fav in a Triennial Stakes. In contrast to today, Trappist‘s 9st 10lb in the Wokingham, gave 20lb to the next highest and 59lb to the bottom weights on 5st 7lb, in a field of 24. The distances were 3/4 length and a bad third. I have set out below a short biography. Frederick James Archer (1857-1886), known as ‘The Tinman’, due to his fondness for cash, was the greatest jockey of his generation. Such was his popular acclaim, that London cab drivers would hail each other with “Archers up,” to show all was well. Fred was born at St Georges Cottage, Cheltenham on 11th January, 1857. His father, William Archer, was a successful N.H. jockey, and won the Grand National on Little Charlie, the year after Fred was born. At the age of 11, Fred signed apprentice indentures to Mathew Dawson at Heath House, in Newmarket. It was there he learned his trade, and weighing only 4st. 1lb, he partnered all the stables lightweights in handicaps. Eventually, when he grew tall, he would rap his legs around the horse, squeezing him for the final drive. Powerful in a finish, he was rarely beaten and used the whip unsparingly. Between 1874 and his death he notched 21 British Classics, including four in the Oaks: Spinaway (1875), Jannette (1878), Lonely (1885), and Wheel of Fortune (1879), who he swore was the best filly he ever rode. He also rode five winners of the Derby: Silvio (1877), Bend Or (1880), Iroquois (1881), Melton (1885) and Ormonde (1886), the greatest horse of the 19th century. During this time his weight rose from 6st 2lb to 9st 1lb, so causing him to endure lengthy periods of wasting. After losing the Cambridgeshire by a head, when putting up a pound overweight and running a fever, he shot himself in a fit of depression on Monday 8th November, 1886, He was 29 years of age. Archer was Champion jockey for 13 consecutive years to 1886 and rode a total 2,748 winners, including 246 in 1885. His lifetime ratio of winners to mounts exceeded 34%, although in 1881 and 1884 it exceeded 41%. His obituary stated: “Backers have lost the best friend they ever had”. On a sunny day, with a crowd of 125,000 and in the presence of the Queen and Prince Philip, the scene was set for a perfect Derby Day. 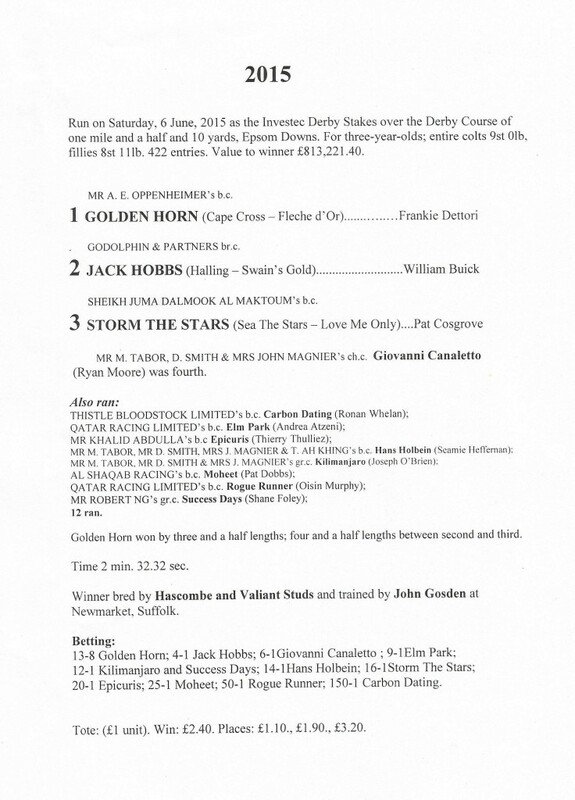 Of all the traditional trials, the Dante Stakes at York seemed to hold the key; Golden Horn finishing strongly to beat Jack Hobbs and Elm Park, with all three going to Epsom’s Breakfast with the Stars to breeze round and show all was well. However, there were many who doubted Golden Horn’s ability to stay another 300 yards. His pedigree being full of mile-to-a mile and a quarter horses. While his owner, Anthony Oppenheimer, still uncertain, needed to be convinced by trainer, John Gosden, before paying the £75,000 supplement to enter. But none need have worried. Jig-jogging along the inside rail down to the start, Frankie Dettori settled him beautifully and when he arrived at the start, he was ready to go on Good to Firm ground. Aidan O’Brien, having trained the last three winners of the Derby had three entries, Giovanni Canaletto, a full brother to Ruler Of The World, being the most fancied, with Hans Holbein (Chester Vase) and Kilimanjaro (Lingfield Derby Trial) making up the team. The field of 12 on their way, Elm Park took them along from Hans Holbein, Storm The Stars and Jack Hobbs. After three furlongs, Hans Holbein (rails) and Elm Park took each other on and drew eight lengths clear of Storm The Stars, Epicuris and Jack Hobbs. On reaching the highest point, Hans Holbein pressed on to a four-length lead from Elm Park and Epicuris, with Golden Horn tucked in at the back of the field in ninth. The order remained unchanged around Tattenham Corner, but into the straight, Dettori brought Golden Horn up the outside to begin his challenge. A furlong later, with the leaders five-wide, across the course, Jack Hobbs shot to the front. Seconds later, Golden Horn swept past Jack Hobbs, who edging left with the camber, was followed over by Golden Horn, who stormed home to win by 3½ lengths. Storm The Stars kept on for third, a further 4½ lengths away. The time, 2 min 32.32 sec, was the third fastest in the history of the race, behind those of Workforce (2 min 31.33 sec in 2010) and Lammtarra (2 min 32.31 sec in 1995). John Gosden, who trained the first two home, previously trained Benny The Dip to win the race in 1997. His wife, Rachel Hood, retained a 37.5 per cent share in Jack Hobbs, with two friends keeping 6.25 per cent each, after Sheikh Mohammed purchased a 50 per cent share after the Dante Stakes. Frankie Dettori, who lit up the afternoon with hugs and kisses to all in the winners enclosure, had last won the race in 2007 on Authorized. The sire of the winner, Cape Cross, had previously sired Sea The Stars to win the Derby in 2009 and Ouija Board, the Oaks in 2004. He currently stands at Kildangan Stud in Ireland at E20,000. go to Books for Sale at the top of the page.